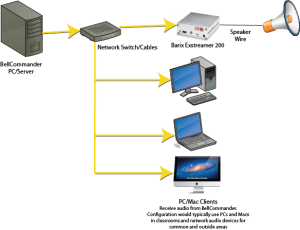 Description: The patented combination client PC/network audio device configuration allows multiple zones to be created for sending different audio to different areas of a building or multiple buildings. The PC running BellCommander should be connected to the network at all times. Areas which have PCs installed, can receive audio from client PCs while areas with no PCs can receive audio from network audio devices. This configuration is ideal for schools with PCs already available in some areas, such as classrooms, but not in other areas, such as the cafeteria. We are an authorized dealer for Barix and can provide the full line of Barix products with discounts for multiple unit orders.